It’s officially spring, which means that I’m back at the farmers market looking for seasonal produce to experiment with in the kitchen. I’ve mentioned before that I am not the greatest meal planner, I usually rely on wandering through the market until something strikes my fancy and then build a recipe around whatever vegetables intrigue me. At my age, a farmers market is the closest thing to a toy store, full of exciting things to play with and explore. Local, seasonal produce will always give you the most varied selection and you will most likely come across a cultivar you’ve never seen before. Last weekend I came across a vendor selling ashwagandha tinctures and decided to try a bottle. As I was checking out, he asked me if I was interested in taking a bag of freshly foraged nettles and as I am never one to pass up something free, I said sure. I had always avoided them due to their stinging properties but faced with such an opportunity it was worth setting my apprehension aside. The health benefits of nettles are too numerous to list but are definitely worth adding to your diet if you have the opportunity. Nettle tea is an easy way to extract some of the beneficial properties. Just place a handful of fresh leaves into a teapot, cover with hot water and let steep for 10 minutes. The tea is a lovely green color and loaded with beneficial nutrients. 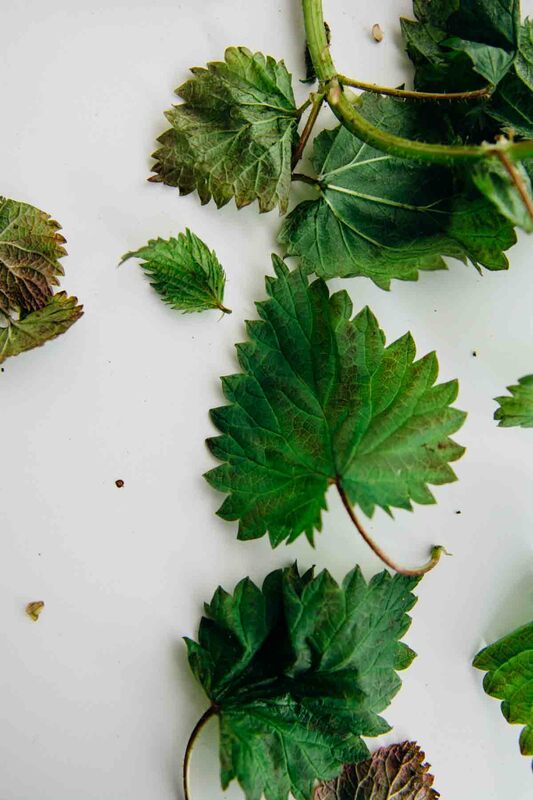 Nettles have a high iron content, support healthy liver function, relieve seasonal allergies and alleviate joint pain. The list of potential benefits are too long to list but you should Best of all, they taste delicious and can be used as a substitute for your favorite cooked greens. 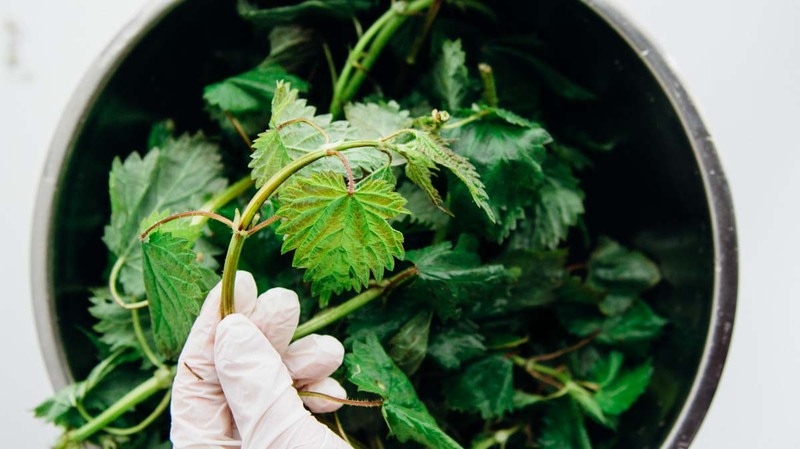 The only caution that needs to be taken is that you need to raw nettles with gloves or tongs. Once they are blanched in boiling water, the stingers are deactivated and you can handle them as you would any green. I chose to blanch the leaves whole and then remove the stems after cooking but you could also cut the leaves off before blanching. Just like spinach, nettles reduce greatly once cooked. I found that five cups of raw nettles resulted in about a cup of leaves ready for pesto. I made a dairy free version for my son but you can substitute the nutritional yeast with 1/4 cup of grated parmesan for a more traditional pesto. 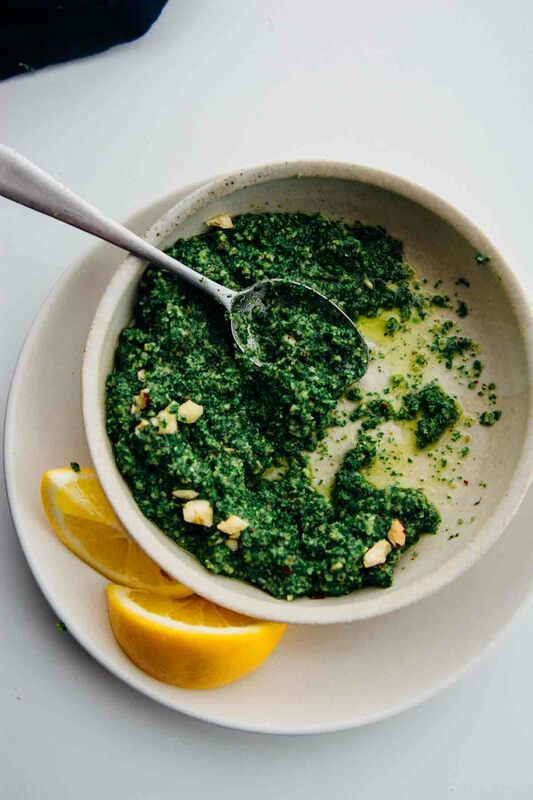 We enjoyed this pesto immensely, it has a lovely deep herbaceous taste that I found much stronger than spinach and it kept it’s color really well. We ate it on crackers with some sliced hard-boiled eggs and tossed it with pasta for an easy dinner. I’ve included a quick video to show you how easy it is to prep this amazing superfood! 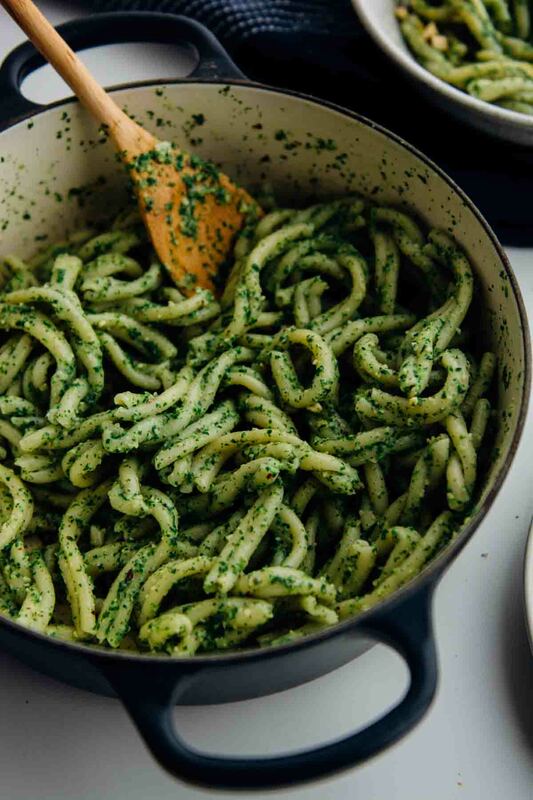 This spring nettle pesto is easy to put together and is delicious slathered on bread or tossed with your favorite pasta for a quick and easy dinner! Prepare an ice bath by filling a bowl with ice and covering with cold water. Bring a large pot of boiling water to a boil. 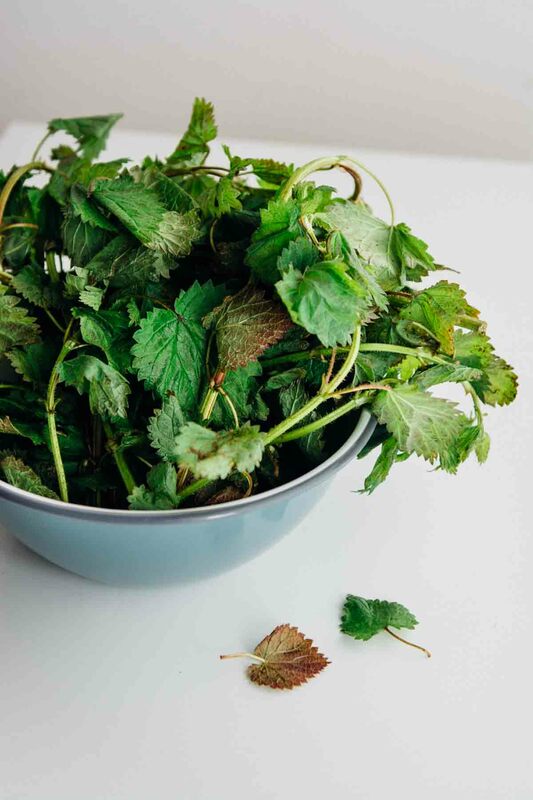 Using gloves or tongs place the nettles into the pot and cook for one minute, you may need to do this in batches if your pot isn't very large. Remove the nettles and immediately place into the prepared water bath. The nettles are now safe to handle with your hands so you can take your gloves off. Remove the nettles from the water and using your hands squeeze as much water as possible from the greens. 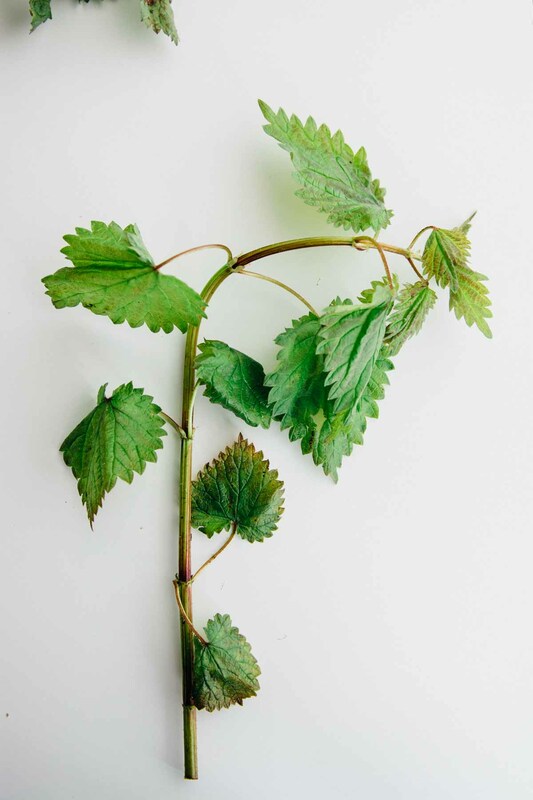 Strip the nettles from the stalks and discard the tough inner stems. 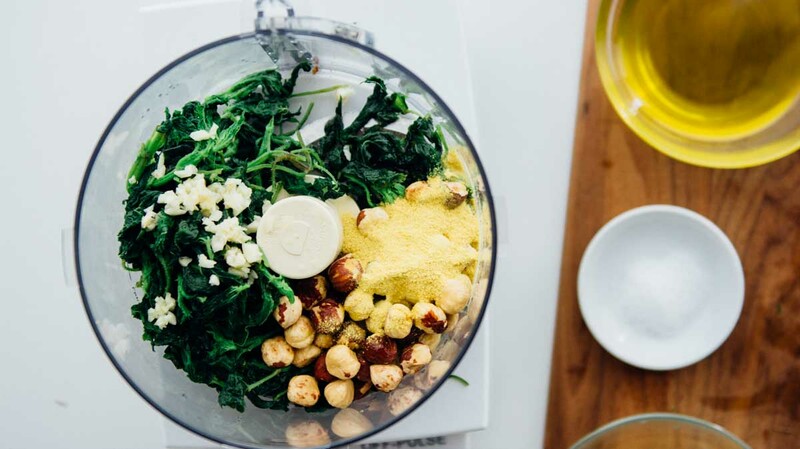 Place the nettles into the bowl of a food processor and add the garlic, lemon juice, hazelnuts, nutritional yeast, salt and olive oil. Process until the mixture is blended but still has a bit of texture. Taste and add more salt or lemon juice if desired. 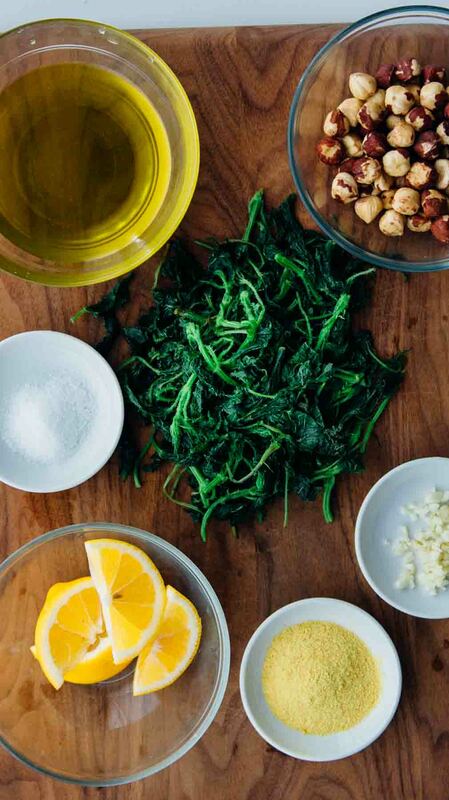 Serve over cooked pasta with a sprinkling of chopped hazelnuts and a sprinkle of nutritional yeast. 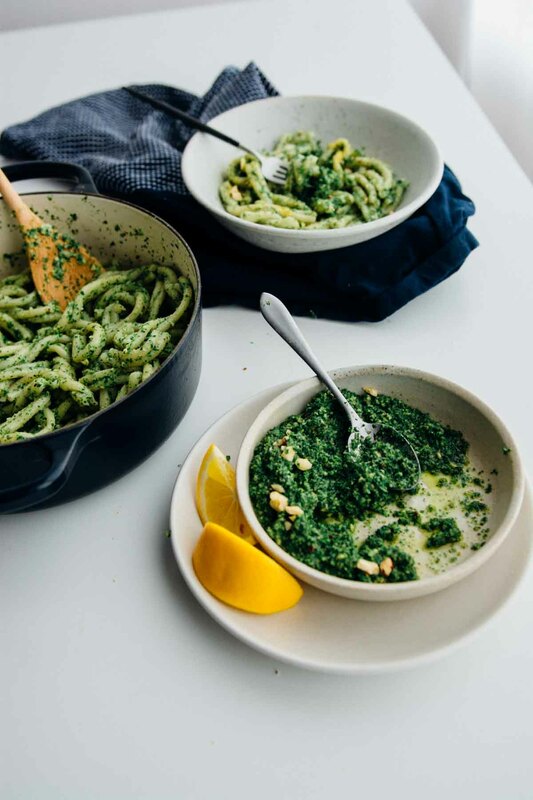 I usually dry my nettles and have never blanched them before to use fresh – this pesto looks lovely. 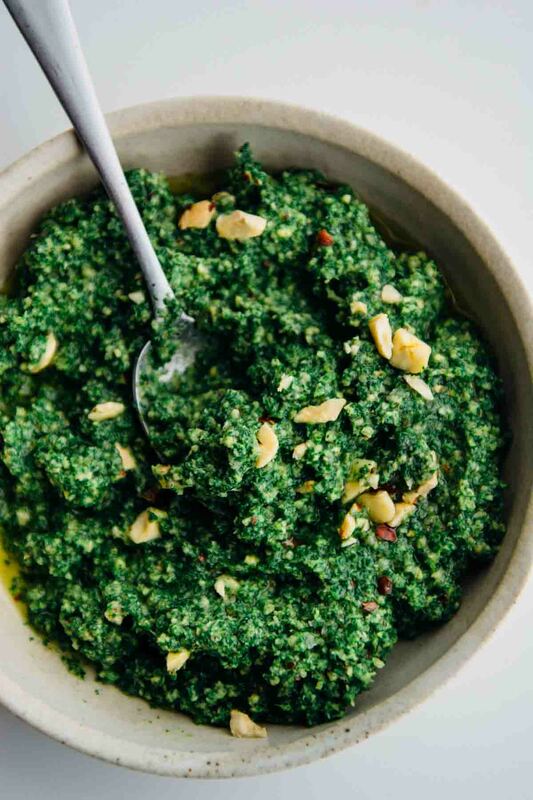 The colour is so stunning, much prettier than spinach pesto! I was gifted a bag of nettles last week and had never used them before. I bought two more bags this morning to make a double batch of pesto, one to freeze and one for our meals this week. Today, I used a pair of scissors and trimmed the leaves off the stems before I blanched them, and I think I prefer this method, it seemed a bit easier than picking them off after they are blanched. They impart such a lovely color and flavor to the pesto, definitely a new favorite. Do you make tea with your dried nettles? 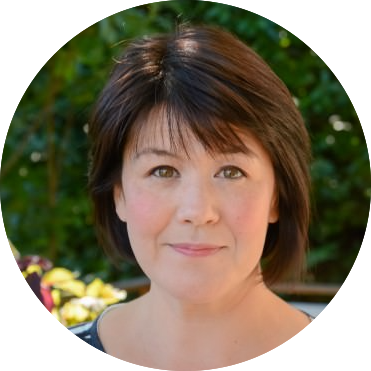 I’d love to hear how you use them, they are such a nutritional powerhouse! This recipe is excellent! I made a few alterations by adding some lemon zest, used Parmesan instead of the nutritional yeast, and added a bit more olive oil.. Very nutritious and pretty!